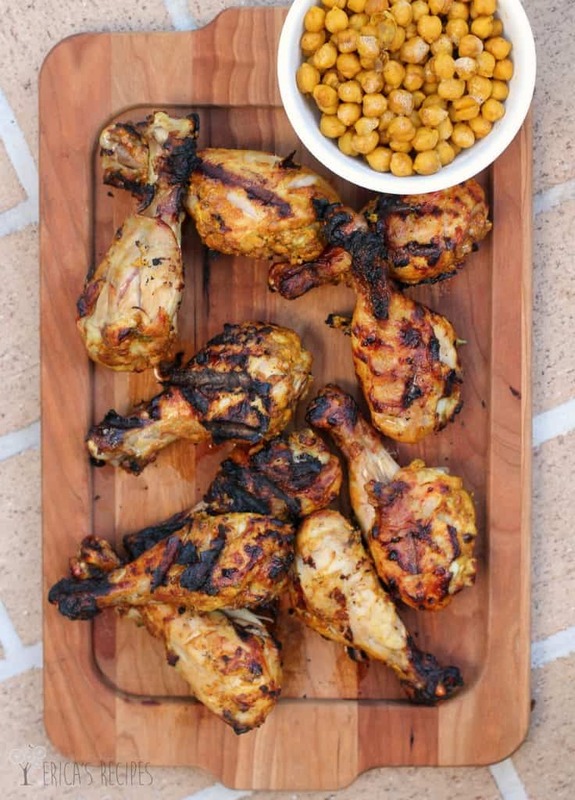 Grilled Tandoori Chicken with Spiced Chickpeas is an affordable, healthy, and delicious dinner recipe, easy to prepare and perfect for the weeknight. For the second installment in my new Cheap Meal of the Week dinner series, I took some on-sale chicken and threw my spice cabinet at it. Literally. Nothing beats cooking Indian foods to help you use up those spices. 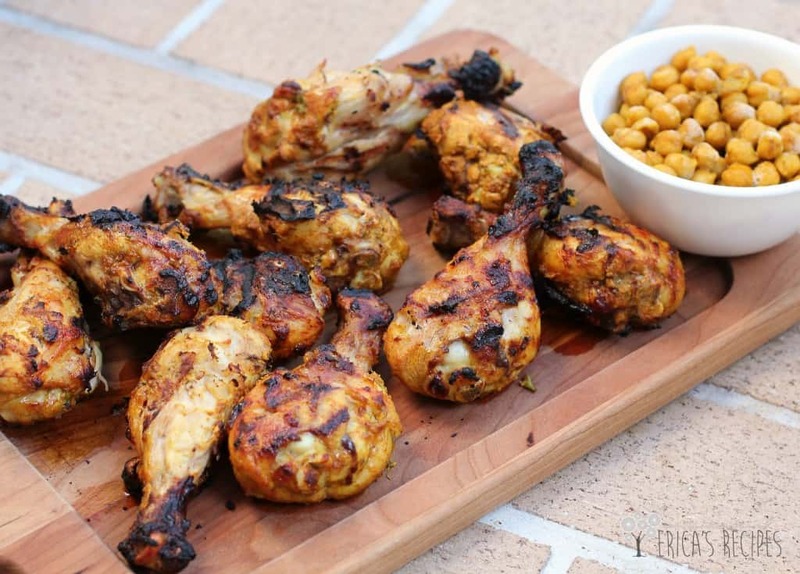 And nothing beats chicken drumsticks – you can get them cheap and if you pull the skins off, they’re not that much different from breast meat nutritionally. Besides, they are so much more flavorful! I can get my kids to eat drumsticks any day of the week. 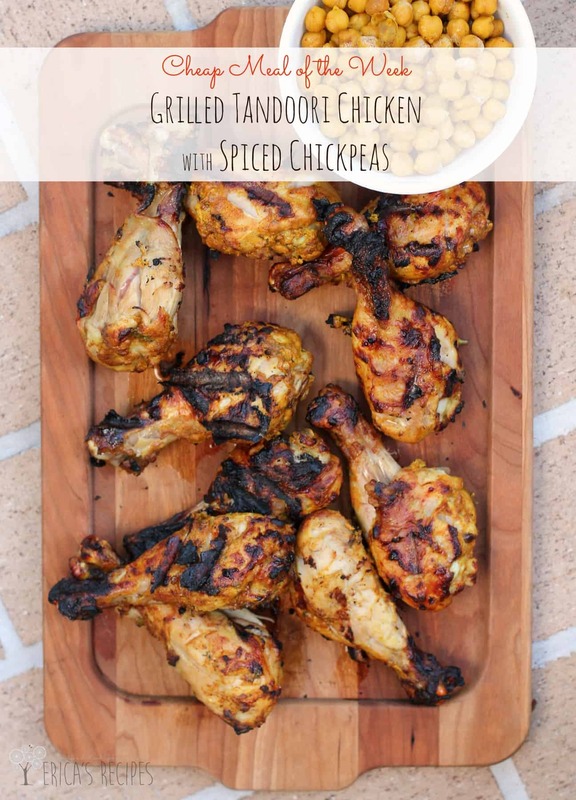 So, this chicken ….once I pulled the skins off, I marinated in a DEE-lishious and healthy yogurt-spice mixture. This made this chicken so juicy and tender! I’ve never marinated in yogurt before, so I’m a bit giddy talking about it – it was that good (squeal!). 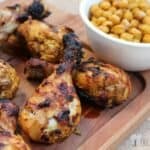 I grilled ’em up and made some easy, on-the-side chickpeas with similar flavors to finish our meal. The aromas and flavors were amazing, and it was a meal I felt so good about serving my family. ….And btw, the leftovers reheated very well for lunch the next day too. an affordable, healthy, and delicious dinner recipe, easy to prepare and perfect for the weeknight. Remove the skins from the chicken (using a paper towel to grasp the skin allows you to do this in a jiff). Using a sharp knife, slice 3-4 shallow cuts into the chicken meat. In a bowl, whisk together the next 13 ingredients (through cilantro). Transfer marinade into a large ziploc bag and add the chicken. Seal the bag, then move the chicken around in the marinade to coat the chicken completely. Put the bag in the refrigerator overnight (I have done up to 2 days). For the chickpeas, combine all ingredients in a medium pot. Bring to a boil and simmer 20-30 minutes or until the liquid is quite reduced to ~1/2 c.
Using thongs to hold a wadded up paper towel dipped in vegetable oil, oil the grill grate to prevent sticking. Add the chicken and grill 8-10 minutes. Turn the chicken and grill another 8-10 minutes until internal temperature is 165F. Remove the chicken from the grill and let rest 5 minutes before serving. Serve with the Indian-Spiced Chickpeas. Yield: 4-5 servings. I paid $11.64 to pick up what I needed: $6.74 for the chicken (which was on sale for $1.99/lb), $2.50 for the yogurt, $0.42 for the ginger, $0.79 for the chickpeas, and $1.19 for the vegetable broth. All of the other ingredients were pantry stuff I had on hand and I had cilantro in the garden (it would have cost $1.99). 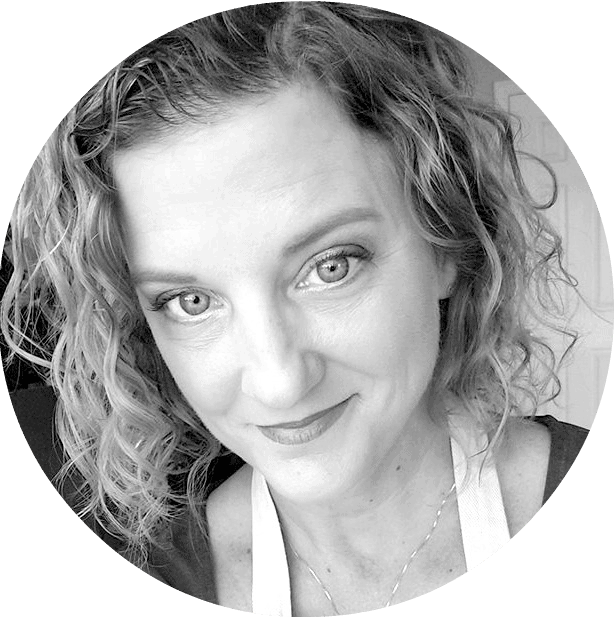 See this article about My Pantry to learn more about what staples and ingredients I keep stocked. This looks absolutely incredible. I am so going to make this. 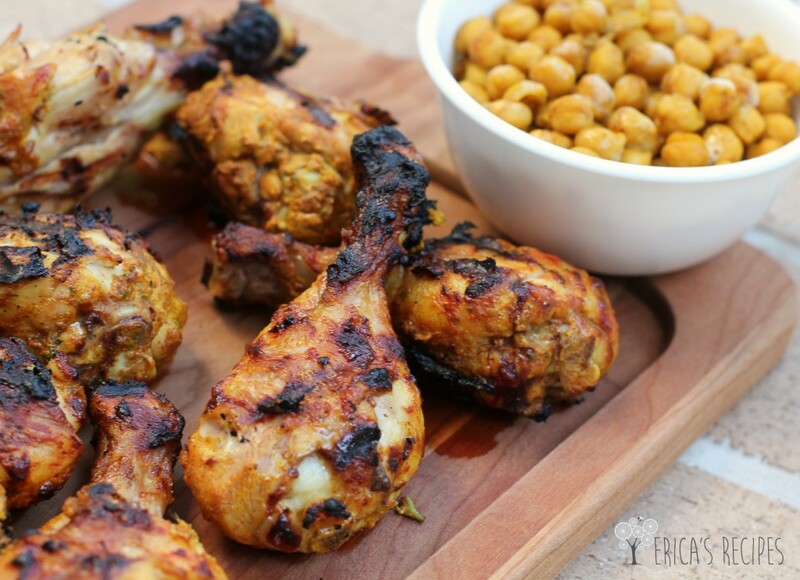 I love this recipe … Tandoori chicken is one of my favorites. Definitely pinning this one for later! Erica, this recipe sounds absolutely delicious. I love recipes with lots of different flavours in them. Thanks for linking up to Foodie Friends Friday and I hope you join us this week for our special 100th party. OMG this looks totally amazing! Beautifully dne and looks gorgeous!